Can Negative Reviews Increase Conversions? Blog » Conversion » Can Negative Reviews Increase Conversions? After years of running a successful business you’ve finally got your first negative review. You know the effect customer reviews can have on your sales. Positive social proof helps drive sales and conversions whilst negative reviews and comments can immediately turn new prospects away from your business. Do you throw in the towel? Pat yourself on the back for a job well done, call it a day and move on to your next business idea? Ignore the review. Don’t feed the trolls and all that. Delete/censor the review to stop new prospects from gaining an unfavorable view of your business. See how you can turn the tide in your favor. In nine out of ten situations the first two options are a terrible idea. The only time you should ignore a review is when it truly is someone trolling for laughs – and censoring, well, that never goes down well. The best option is almost always to address the issue and see how you can turn the tides on your negative Nancy. Turning the tide doesn’t have to be putting some horrible PR spin on the review to make it seem like you were always in the right. Sometimes it’s about accepting you were wrong and rectifying the situation. Contrary to popular belief, accepting the faults in your business and not deleting or spinning negative reviews can actually help increase your overall conversions and lift sales. Don’t worry about those negative reviews. They can actually increase #conversions! Why Even Bother With Reviews? Knowing that things could take a turn for the worse there’s a temptation to completely forego utilizing product reviews on your site. Why risk receiving negative reviews? Surely it would be easier to simply disable all comments and never have to deal with negating those who aren’t happy with what you offer. There’s good news and bad news with this approach. The good news is yes, you will reduce negative feedback and probably save time by not having to counter negative comments. The bad news, you’ll also lower your conversions. Wait… what? By disabling reviews you’ll lower conversions? Even though you’re also reducing the amount of negative feedback? That’s what the data says. According to Revoo, the potential uplift from including reviews on your site is around 18%. An 18% uplift in sales is nothing to be scoffed at. 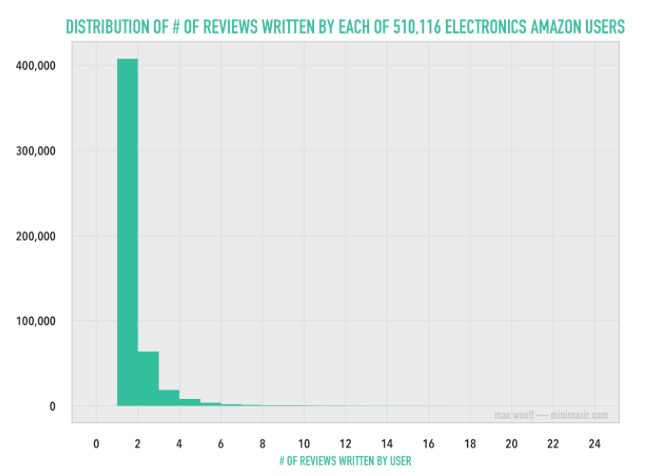 However, what really drives the point home is the differing success rates of products with and without reviews. Bazaar Voice analyzed the effect of reviews on figleaves.com, a UK based clothes retailer. 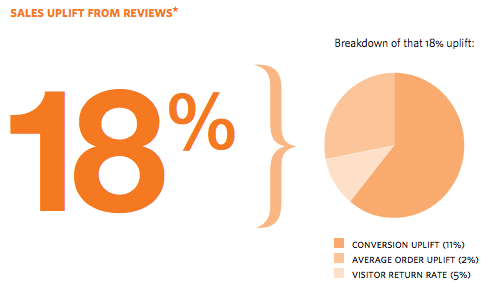 They found that products with 20+ reviews had an 83.85 higher conversion than those without. I know what you must be thinking. You’re looking at those stats and assuming that it’s referring to the inclusion of positive reviews. 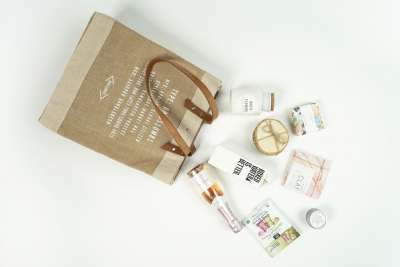 After all, no one’s going to trust a brand that has negative feedback, right? Apparently, they will. In fact, having negative feedback on your site can do wonders for building trust. It’s not about presenting an image of faultless perfection to your prospects, it’s about building trust. Trust isn’t built on a facade, it’s built through honesty. That’s why you should include all reviews on your site. Both the good, and bad. Have you ever been introduced to a seemingly perfect individual? They’re great with people, have the perfect job, never swear, don’t drink or smoke, are always smiling and never have a bad word to say about anyone. For all their outward appearance something seems off. Somewhere at the back of your mind you’re trying to figure out what their dark secret is. No one can be that perfect and not have some huge flaw they’re trying to hide. It’s the same when it comes to a business. Every time I’ve looked at the reviews for products and see nothing but over zealous positivity I think one thing. Scam. Anyone who’s been involved in business before can attest to the fact that things do, and will, go wrong at some point. No company has a 100% record of success and happy customers. When you see nothing but five star reviews you start to question the legitimacy of the business. Are they censoring negative reviews? If so, how many? Are they paying people to provide fake reviews? Are they creating fake reviews themselves? It all leads to a lowering of trust in your brand. According to a study by Revoo 30% of readers suspect censorship or fake reviews when shopping online. On the other side of the coin, 68% of customers trust reviews more when there’s a healthy mix of both positive and negative reviews. Negative reviews also draw in more qualified prospects. Today’s consumers are smarter than ever before and have access to a wealth of information about you, your brand and your products. That same Revoo study monitored the purchasing habits of those who actually look for negative reviews. Any guesses on what they discovered? Yup, prospects who look for negative reviews actually convert at a higher rate than those who don’t! Sometimes having a little negativity on your page isn’t all bad. However, if you really want to turn that negative review into a conversion driving force, here’s what you need to do. 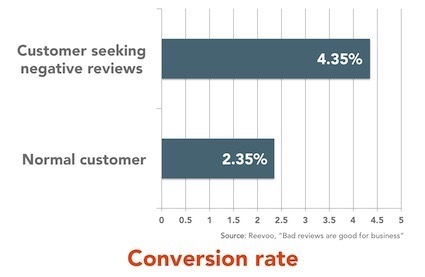 How to turn negative reviews into conversion driving powerhouses! The average customer isn’t going to seek out a way to leave a review that’s beneficial to your company. 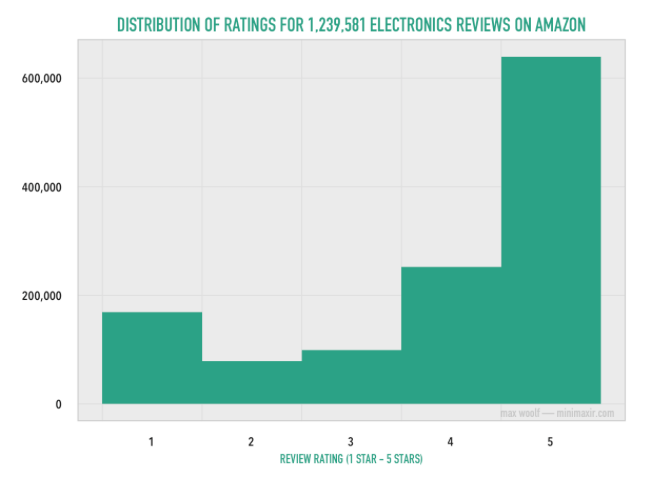 This study by Max Woolf shows how over 80% of Amazon customers left only one review. Max also goes on to note how, aside from the perfect reviews, most reviewers tend to give either a four or one star rating. So out of the small percentage of your customers who leave reviews you can expect them to be either a glowing reference to your brand’s awesomeness, or a damning account of your incompetence. So much for the middle ground! Looking at the above stats and noting my previous point on how negative reviews are a necessity you might think everything’s going to work itself out. After all, the positive still outweighs the negative. However, people respond to reviews in different ways. If left unanswered a negative review could prove a deal breaker for new prospects or cause further negativity to build. Fortunately these negative reviews also provide the perfect opportunity for extra engagement which can turn into an extra persuasion point. A short while back I was doing a little review mining research for a client. One of my research targets was a large UK Martial Art’s equipment retailer. During my research I noticed how this brand had managed to turn an error into a positive review. If left alone, there’s a good chance this could have turned into a deal breaking negative review instead of the positive testimonial it is today. Below is the comment in question that was published on Facebook. Now, even without knowing what the hiccup was it’s easy to see that it affected this customer. It’s highly likely that, if not addressed, this customer would have left a negative comment and feedback which could have put future prospects off the company. However, by addressing the problem Blitz managed to turn a potential negative into a complete positive. In fact, I’d argue that the above is far more persuasive than a straight positive comment as it demonstrates the company’s duty to their customers. Of course in this case the problem was solved before the review was written, however, the same tactic should apply when retroactively addressing a customer problem. Sure you might not get the initial complaint removed, but you’ll likely gain a review that contradicts the initial review and builds further trust in your brand. There’s also data that suggests quickly resolving the problem leads to an increase in repeat business. According to a Lee Resource Inc study, 70% of your complaining customers will return to your business if you’re able to quickly resolve their problem. Negative reviews aren’t all bad. In fact they offer the perfect opportunity for you to turn the tide on your reviewer, rectify the problem and get yourself a positive review to counter the initial negative outburst. One of the most important aspects for increasing conversions is understanding your audience. 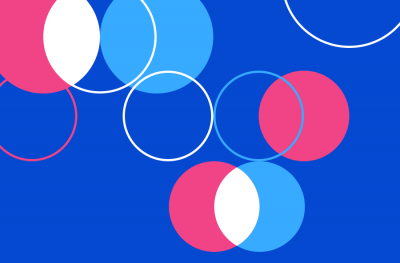 You need to know their likes, dislikes, elements of your UX that confuse, what copy best resonates with them and of course, the elements of your product they love and loathe. Audience research is a big deal in product development and reducing the friction along your funnel. When done well it can help you find the major changes and minor tweaks that increase sales and revenue. However, most of the methods used to get a better understanding of your audience require you to make the first move whilst also being very time intensive. Sending surveys to then analyze the results or going old school and picking up the phone are all very labor intensive. One method of audience research that’s often overlooked is good old review mining. If you’ve activated reviews for your products then this is the perfect way to find out exactly what the general public has to say about them. But best of all is that you have to do very little to gather the raw data you need for analysis. The honest answers are already there for you to analyze! Even negative reviews can have a positive effect on your business and #conversions. All you need to do is sift through the various reviews to find recurring themes, problems and language. Before long, you’ve got a great insight into the needs of your audience, the language that will best resonate with them and the best ways to improve your product. When it comes to product development you’ll find that the negative reviews are the most useful. However, you should still be taking every effort to keep the negative reviews in check. Yes they might be useful, but if you’re seeing more than a 1/10 ratio of negative to positive reviews, then something’s gone really wrong. It’s time to stop optimizing and look at rectifying the problem. 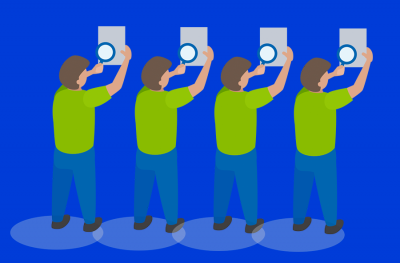 You’re no stranger to the effect of social proof on conversion rates. However the focus is always on gaining the most positive reviews and testimonials possible, perhaps even going so far as to censor negativity. Whilst this is understandable, all research points to negative reviews adding a much-needed boost to your trust rating. Left alone they can help your company seem more accessible and legitimate. No one believes that a business has never stumbled. Yet, if you really want to make the most of your negative reviews to drive conversions, use them to open dialogues and show the aggrieved party and future prospects that you’re a business who cares. It’s this step that will really boost trust and have a positive effect on your overall conversions.